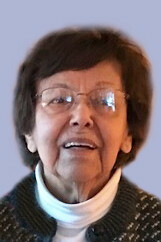 Sheila Daria Kittel, age 88, passed away Wednesday evening, April 5, 2017 at the Northwestern Medical Center in St. Albans with her loving family by her side. Born in Georgetown, British Guiana September 7, 1928. The daughter of the late Joseph Clement DeAbreu and Matilda (Ferreira) DeAbreu. A former British subject of Portuguese descent and proud naturalized US citizen, as a very young woman Sheila left her home in the tropics to make a new life with an American airman, the love of her life and native Vermonter, Everett C. Kittell. They settled in Swanton, initially working side-by-side to launch what became Kittell’s Market, a grocery store and fixture in the community for over 40 years. Everett then tended the store and Sheila the family home on Spring Street. While living there, they welcomed and raised six children, sending them all to St. Anne’s School, reputable colleges, and then nationwide to equally happy lives. From her first days in Swanton, Sheila invested herself in the community. Active in the Parish of the Nativity, Sheila developed a large circle of friends among the clergy and her fellow parishioners. But it was after her youngest child became self-sufficient that Sheila invested her considerable energy in earning an Associate’s degree in Education, joining the staff at then Swanton Elementary School. As a para professional and lifelong learner, Sheila continued taking courses at UVM and attending numerous educational seminars and conferences, becoming and remaining the go-to teacher for students needing extra help to succeed. Many did succeed, thanks to Sheila’s efforts working and volunteering at the school. It was there that Sheila found her true calling and many of her closest friends, always putting her students’ interests first. Sheila is survived by her six children; Gary Kittell and his wife Elisabeth, Deborah Silber and husband Fred, Andrew Kittell and wife Patricia McNally, Michael Kittell, Stephen Kittell and wife Erin, Mary Kittell and husband Tony Taylor. She also leaves ten grandchildren; Eric Kittell, Justin Kittell. Rachel Silber-Goetzelman, Rebecca Silber, Stephen Silber, Charlotte Kittell, Sierra Linsley Hardy, Amelia Kittell, Grace Kittell, Ethan Kittell. Great grandchildren; Lily Zelman, Pieter Goetzelman. In addition to her parents; Sheila was predeceased by her husband Everett in 2009, and 10 siblings living in either Canada or British Guiana at the time of their passing. A Funeral Service will be held Saturday, May 20, 2017 at 12:30 p.m. at Kidder Memorial Home, 89 Grand Avenue, in Swanton. Father Luke P. Austin will be officiating. Interment will follow at the Kittell family lot in Saint Mary’s Roman Catholic Cemetery. Friends may call at the funeral home on Friday evening May 19th from 4 to 7 p.m.